In 1869, Chicago was becoming an increasingly crowded and dirty place. A group of businessmen saw an opportunity to provide people of means with an alternative to the muddy streets and squalor of the city. They leveraged rail access to create a new (and speculative) kind of residential development nine miles west of downtown. Living there would mean a short train commute - just far enough away to provide respite from downtown conditions. Starting with a blank canvas of 1,600 acres of purchased farmland, the Riverside Improvement Company arranged for a complete utility infrastructure - water, sewer, and gas for lighting. They called their brand-new community "Riverside" for the Des Plaines River that flows through the site. 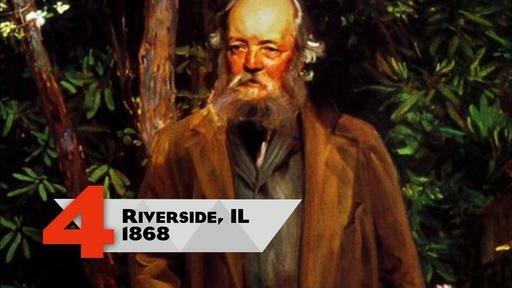 To design and plan the village, they hired Frederick Law Olmsted and his partner Calvert Vaux, whose Central Park success a decade before had made them superstars of design. Olmsted's signature approach was to create a picturesque, landscaped topography. Inspired by the winding Des Plaines River, he eschewed a standard city grid, instead creating a series of curvilinear streets that wound across each other - a pattern that resulted in dozens of tiny triangular mini-parks. Olmsted altered the grade to be more pleasing to the eye and to allow for discovery of new scenes as one moved through the development; he moved large trees and planted others to create charming vistas. Completing the picturesque vision of this self-contained village, he planned a town square with water tower and business district. In 1871, when the Great Fire decimated Chicago and before Olmsted's plan was fully executed, the developers went bankrupt. 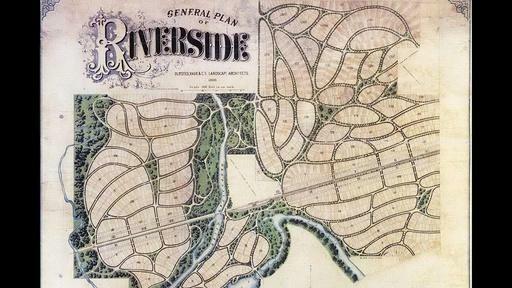 But before long, Riverside picked up momentum again, with community resident and	notable architect William LeBaron Jenney stepping in to complete the town plan, and other notable architects of the day such as Frank Lloyd Wright and Louis Sullivan designing homes. Riverside today is a veritable architecture museum. Beyond that, it serves as a record of what "ideal" looked like for the first suburban commuters. Riverside was designated a National Historic Landmark in 1970. Explore the Riverside community site. Browse an interactive map of Riverside. Riverside, Illinois departed from urban street grids to create a park-like suburb just a short train ride from the city.